One of the claims the politically correct and various forms of other detractors make is - December 25 as the birthday of Jesus originated with a pagan Roman Celebration - Sola Invictus and/or Saturnalia . In some cases they will continue to say that the early Catholic church made up the December 25 date just to steal a pagan holiday. "In the 4th century CE, Christianity imported the Saturnalia festival hoping to take the pagan masses in with it. Christian leaders succeeded in converting to Christianity large numbers of pagans by promising them that they could continue to celebrate the Saturnalia as Christians." So the proponents of this myth place the first reference to the birth of Jesus on December 25 as being in the latter half of the 4th century or 350 - 399 AD. Over the years I have found that the politically correct and those who use such to pursue their agenda rely upon a majority people not knowing a lot of history. So let's look into this theory that the birth of Jesus on December 25 originated in Rome in the last half of the 4th century to use an existing Roman pagan holiday(s) - Sol Invictus and Saturnia. Thus December 25 was then celebrated as the birthdate of Jesus and the celebration became Christ-mass - shortened later to Christmas. We need to start by understanding some issues about calendars. Our calendar today is not the same as in historical times. In 46 BC, when the Roman "Julian Calendar" was adopted, December 24th was the shortest day of the year. Therefore, December 25th was the first annual day that daylight began to increase. Thus, the origin of the REBIRTH or Annual Birthday of the Invincible SUN. In accordance with the Roman "Julian calendar," the "Saturnalia" festival appears to have taken place on or about December 17th; it was preceded by the "Consualia" near December 15th, and followed by the "Opalia" on December 19th. These pagan celebrations typically lasted for at least a week, ending just before the late Roman Imperial Festival for "Sol Invictus" (Invincible Sun) on December 25th. In 1582 AD. Roman Catholic Pope Gregory the XIII caused the current "Gregorian Calendar" to be adopted, in order to eliminate the solar time shift error introduced by the "Julian Calendar." By December 1582 AD the shortest day of the year had shifted 12 days on the Roman "Julian Calendar" to Wednesday, December 12, 1582. On the new Roman Catholic Gregorian calendar the shortest annual day was numerically shifted back 10 days to the 22nd of December, where it remains to this day; while the original order of the days of the week remained unchanged. The Roman pagan celebration Saturnia basically ended on the day of Sol Invictus which was the day after the winter solstice. Now it needs to be pointed out that virtually every society had some kind of celebration, feast or sacrifice on both the summer/winter solstice and spring/fall equinox. Passover for example was tied to the spring equinox. It was celebrated on the 14th day of Nissan. Nissan was the first lunar cycle after the spring equinox. But it is incorrect to say that Passover originated with pagan celebrations, feasts or sacrifices on the spring equinox. Question: Was December 25 referenced as the birthdate os Jesus prior to the mid 4th century? If so then ithe date of December 25 did not originate as a result of Emperor Constantine making Christianity the official religion of the Roman Empire. The answer is "Yes!" The recognition of the birth of Jesus Christ on December 25 predates the conversion of Emperor Constantine and the 4th century. This is documented in multiple extant (means exists today) historical documents. This article will document one such reference and more will be in the follow-on article. 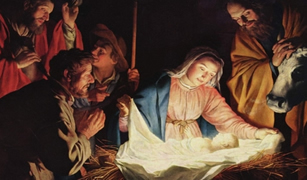 Does this information prove that Jesus was born on December 25? No, it does not nor does it prove this Doctrine is correct. If you want an absolute answer to the question then be sure you are ready to meet Jesus. However It does show that those who claim that they know that Jesus was NOT born on December 25 because that date was chosen in the 4th Century to effectively steal an existing Roman pagan holiday are perpetuating a myth. The origin of December 25 could not be in the mid 4th Century if it occurred at least 150 years earlier.